After a truly embarrassing number of wipes (let’s just say it rivals the number of attempts I put into endgame bosses back when I was a competitive raider), I finally got this down. I’m not a particularly skilled player, but I am diligent. As long as you’re one of those things, you can do it too! Despite the amount of sleep this robbed from me, I really enjoyed the challenge. I had to play around with a lot of different combinations and figure out what worked for me, a player with bad reactions and dps but a lot of patience. Everyone has a different strategy for these, but here’s what ended up working for me. [wowheadrename] I’ve been putting this post together forever but every time I think I’m ready to publish it, something changes or Brewmasters get released. Looking through Vengeance demon hunter talents and artifact traits, you might notice that quite a few interact with each other. For instance, Charred Warblades heals you for 15% of the fire damage you deal, and there are many skills, talents, and traits that increase fire damage further. Let’s just take a look at those. [wowheadrename] There’s something poetic about contemplating vengeance. I’ve spent the weekend playing with Vengeance on the Legion alpha, and I’ve come to the conclusion that they’re great. If I had to draw a comparison, I’d say it’s similar to the protection warrior. They generate resources similarly (through damage taken and rotational abilities) and spend them on similar active mitigation. They both have a cheap, maintenancy ability (Shield Block, Demon Spikes) and a expensive powerful ability (Ignore Pain and Soul Cleave). 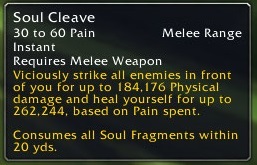 The Vengeance resource, Pain, is the same as Rage, except it doesn’t decay (yet). After that, they two specs are very different. [wowheadrename] Just like before, but with more Pain! Pain definitely comes from Felblade. I also suspect it will come from taking damage, similar to Rage. Wording changes suggest that Soul Fragments no longer spawn on the ground (like a demon-flavored Ox Orb), and instead automatically heal you for 5% hp. Most Vengeance talents are up! But I’m not going to cover them in this blog post.